Theater for children celebrates Antiracism in the square of Hate. A children’s theatrical play was performed in the square of Agios Panteleimonas in Athens center, a neighborhood where many racist attacks have taken place in recent times. A few known far-right supporters argued and tried to cause incidents. 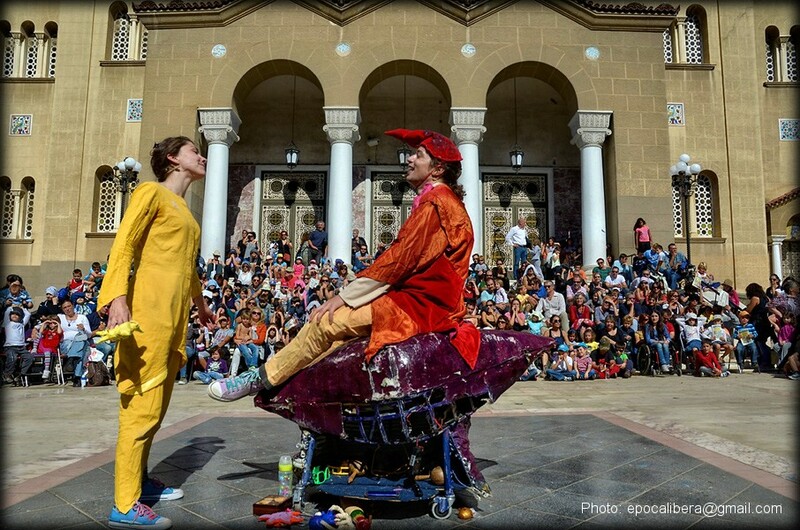 A children’s theatrical play is performed in the square of Agios Panteleimonas in Athens center, a neighborhood where many racist attacks have taken place in recent times. 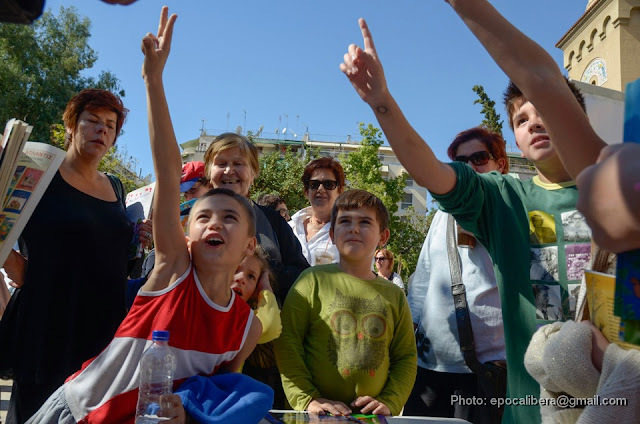 Greece, 21 Oct. 2013. 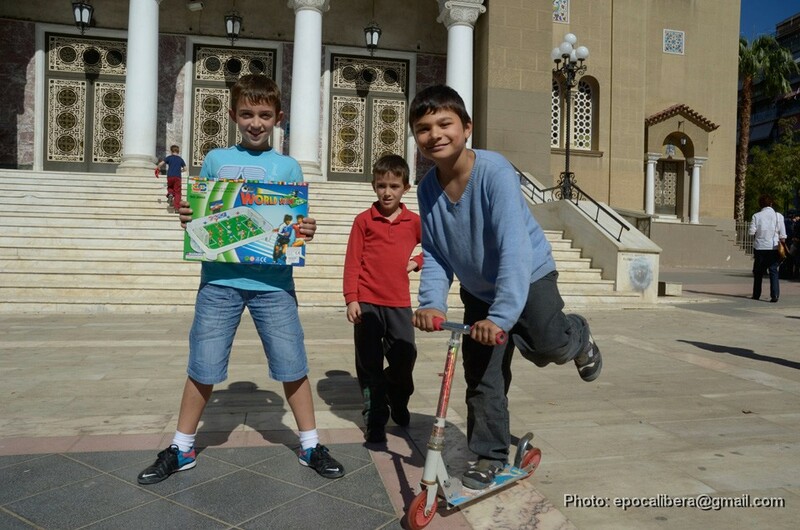 Children play on the steps of the church Agios Panteleimonas, with the presence of Police during the theatrical play. 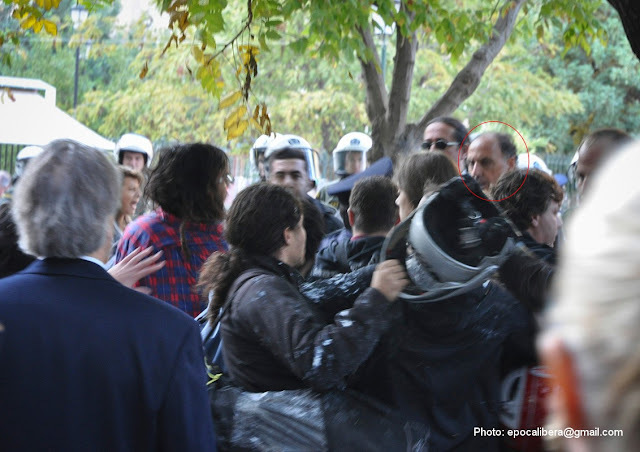 Athens, Greece, 21 Oct. 2013. 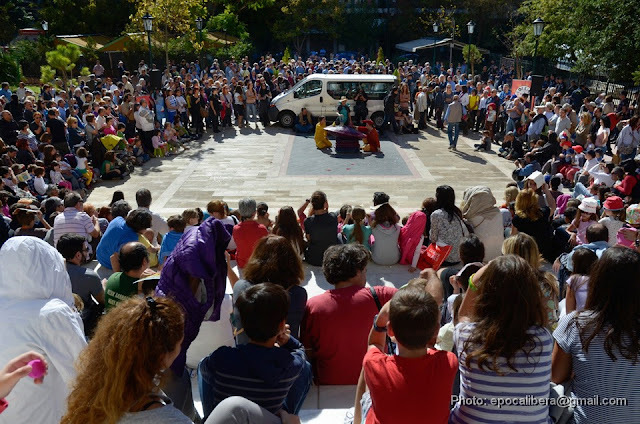 Hundreds attend a children’s theatrical play, that is performed in the square of Agios Panteleimonas in Athens center, a neighborhood where many racist attacks have taken place. Athens, Greece, 21 Oct. 2013. 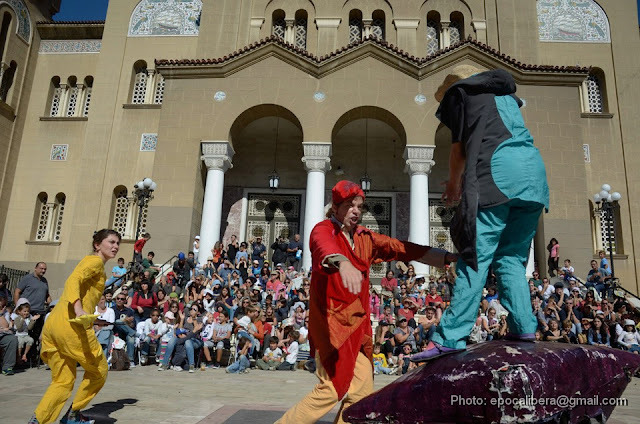 Actors perform a children’s theatrical play, in the square of Agios Panteleimonas in Athens center, a neighborhood where many racist attacks have taken place. Athens, Greece, 21 Oct. 2013. 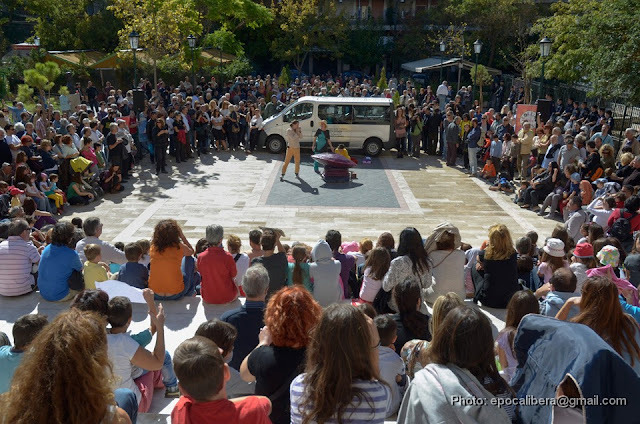 Hundreds attend a children’s theatrical play, that is performed in the square of Agios Panteleimonas in Athens center, a neighborhood where many racist attacks have taken place in near past. Athens, Greece, 21 Oct. 2013. 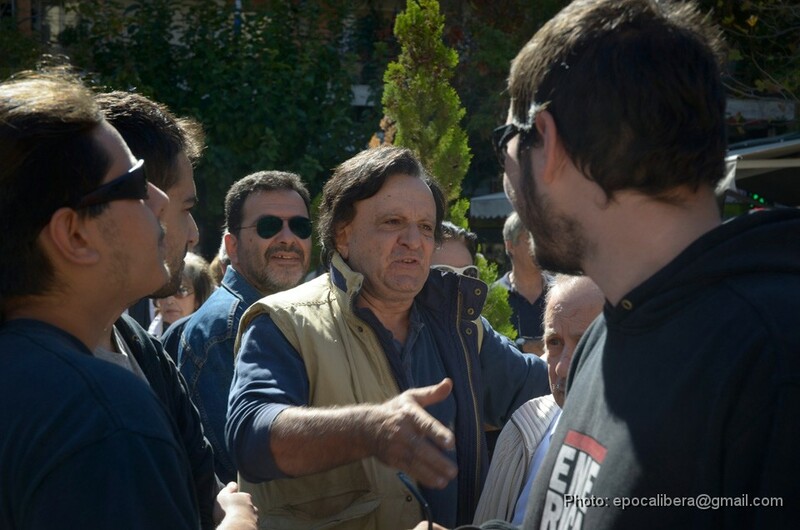 Member of the self-proclaimed Residents’ Committee of Aghios Panteleimonas, argues and try to cause incidents during the play. The same person takes part in the attack of of Golden Dawn members against the left politician Alekos Alavanos in 2010. Athens, Greece, 21 Oct. 2013. 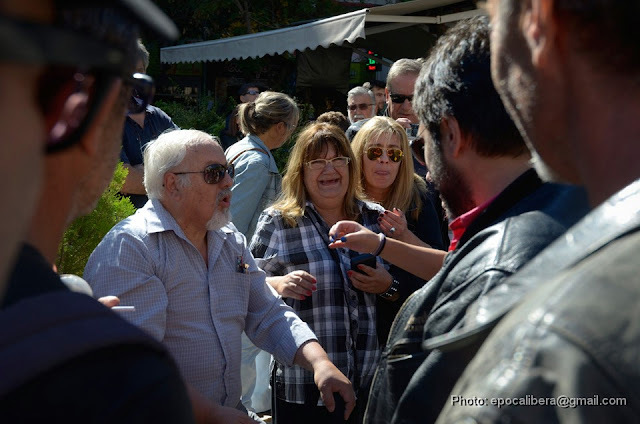 Members of the self-proclaimed Residents’ Committee of Aghios Panteleimonas, that have locked the public playground with the help of neo-nazi Golden Dawn, argue and try to cause incidents during the play. Athens, Greece, 21 Oct. 2013. 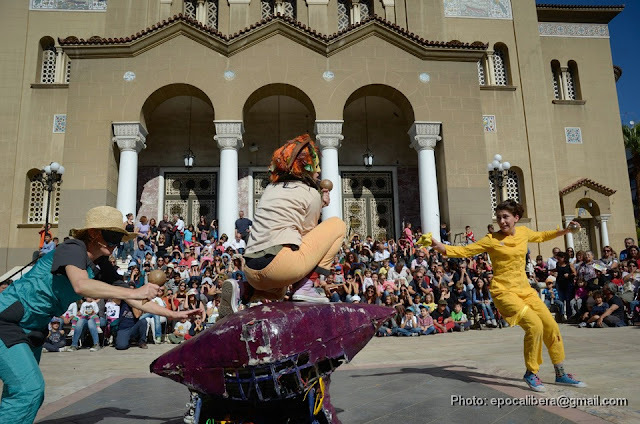 A children’s theatrical play is performed in the square of Agios Panteleimonas in Athens center, a neighborhood where many racist attacks have taken place. Athens, Greece, 21 Oct. 2013. 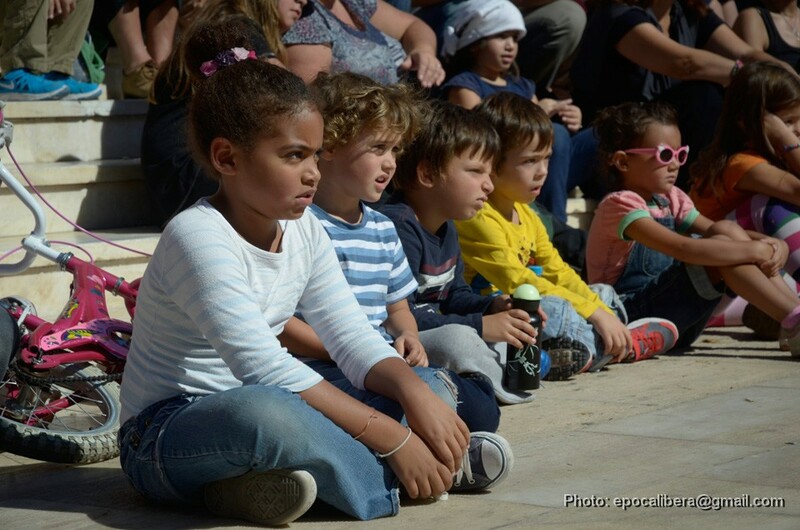 Children watch a theatrical play, that is performed in the square of Agios Panteleimonas in Athens center, a neighborhood where many racist attacks have taken place. Athens, Greece, 21 Oct. 2013. 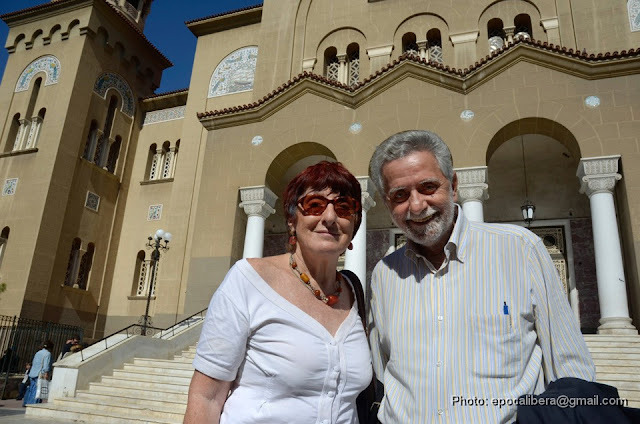 Syriza MP Thodoris Dritsas (R) and Councillor of Athens Eleni Portaliou (L) pictured in front of Agios Panteleimonas during the theatrical play. Athens, Greece, 21 Oct. 2013. Children take part in a draw to win gifts, during a theatrical play, that is performed in the square of Agios Panteleimonas in Athens center, a neighborhood where many racist attacks have taken place. Athens, Greece, 21 Oct. 2013. Children play together, after a theatrical play, that is performed in the square of Agios Panteleimonas in Athens center, a neighborhood where many racist attacks have taken place. Athens, Greece, 21 Oct. 2013. 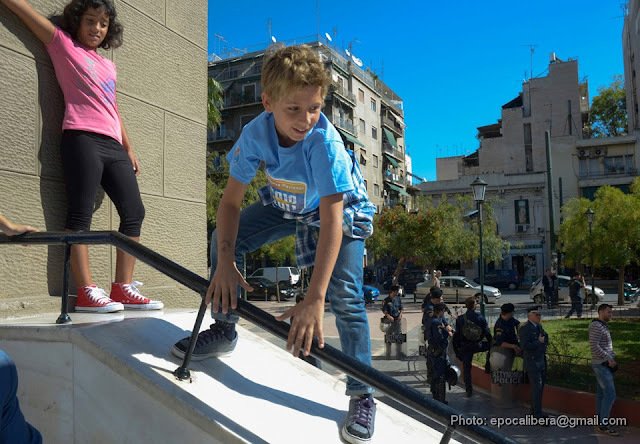 Two children hold the railings of the central playground that neo-nazi Golden Dawn have locked since 2009, in an attempt to ostracize immigrants from public spaces, spread fear and discrimination. Athens, Greece, 21 Oct. 2013. A couple with a baby cannot enter the locked playground. 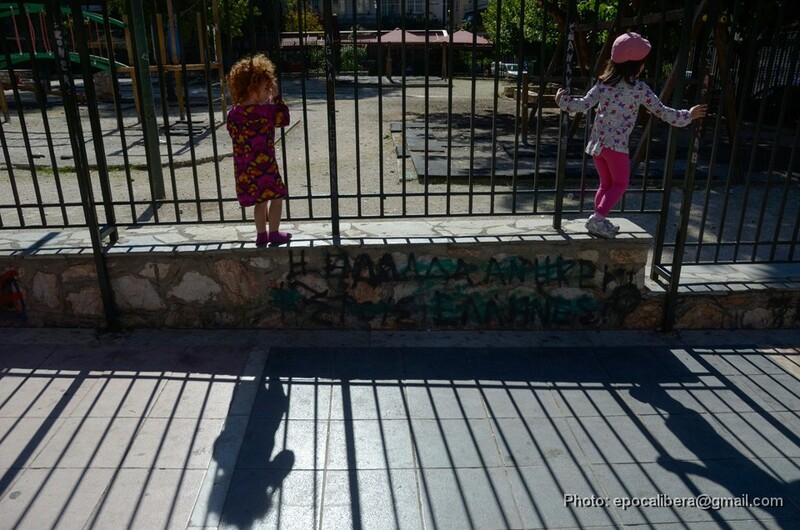 Their way is blocked from Policemen and members of the self-proclaimed Residents’ Committee of Aghios Panteleimonas, who have locked the playground with the help of neo-nazi Golden Dawn. Athens, Greece, 21 Oct. 2013. 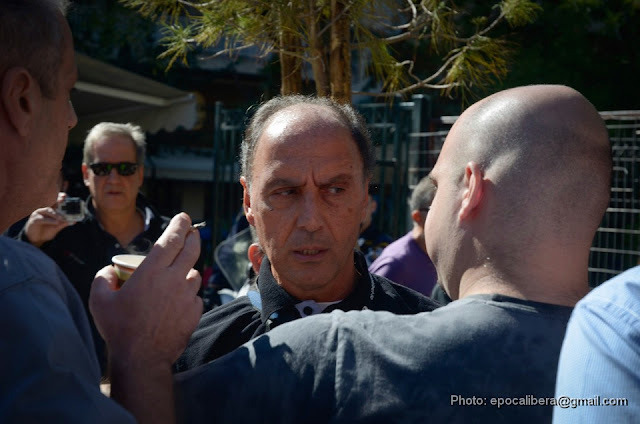 On 22/10/2010, a member of the self-proclaimed Residents’ Committee of Aghios Panteleimonas takes part at the attack of Golden Dawn members against the left politician Alekos Alavanos. The same person causes incidents on 20 Oct. 2013. Athens, Greece, 22 Oct. 2010. 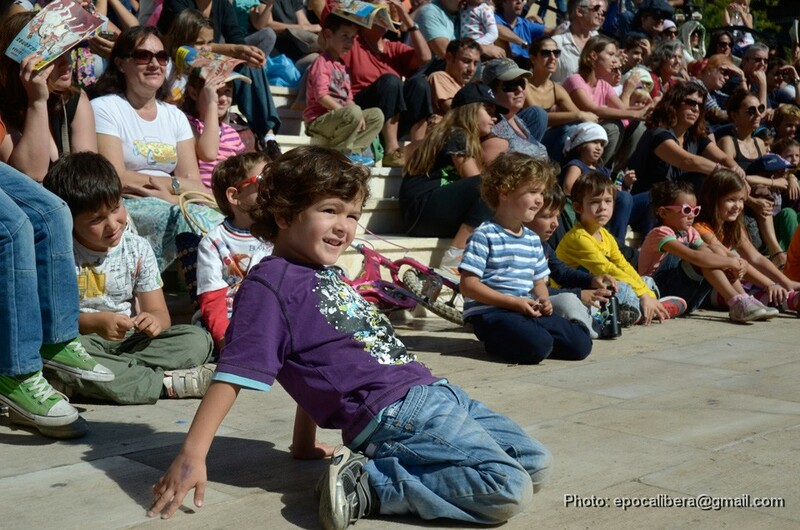 A children’s theatrical play was performed in the square of Agios Panteleimonas in Athens center, a neighborhood where many racist attacks have taken place in the near past. 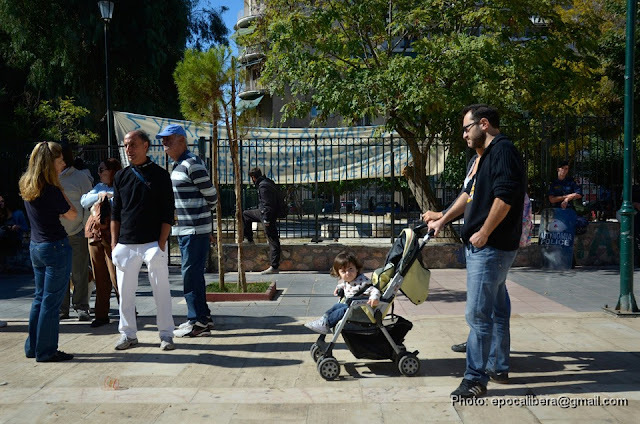 A few Members of the self-proclaimed Residents’ Committee of Aghios Panteleimonas, that have locked the public playground with the help of neo-nazi Golden Dawn, in an attempt to ostracize immigrants from public spaces, spread fear and discrimination, today during the play have tried to cause incidents. Police was there throughout the area. 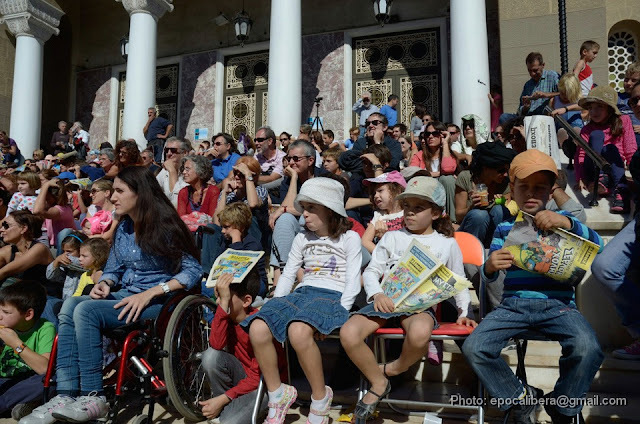 The theater play was directed by Vangelis Theodoropoulos and is a production of the "Theater Of Neos Kosmos", and was a good cause to fill the square with children and parents in an effort for the playground to be unlocked again. The hundreds of spectators applause loudly during and at the end of the successful performance. 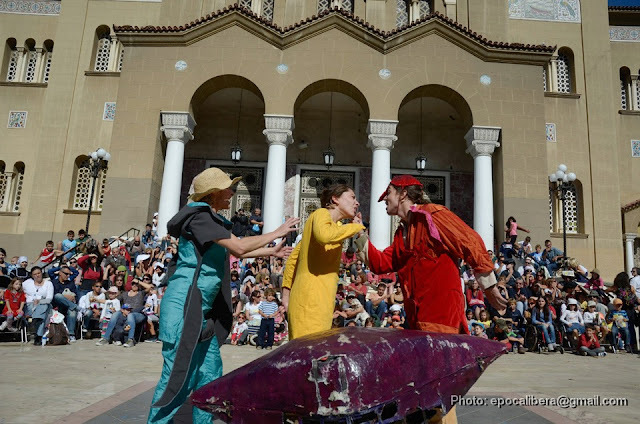 Video: The hundreds of spectators applause loudly at the end of the successful performance. Athens, Greece, 21 Oct. 2013.